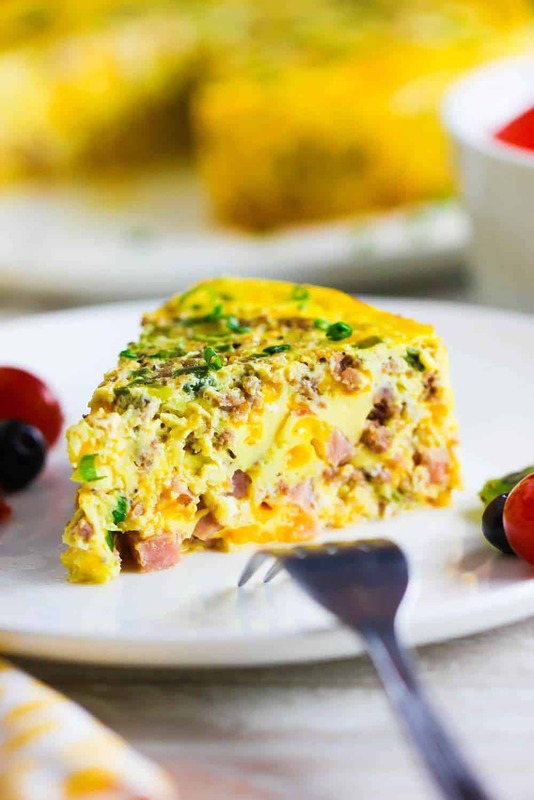 We just love this Instant Pot Cheesy Sausage and Ham Frittata recipe for many reasons. First, and foremost…it’s delicious! That’s always priority #1 in the H2FaL test kitchen. 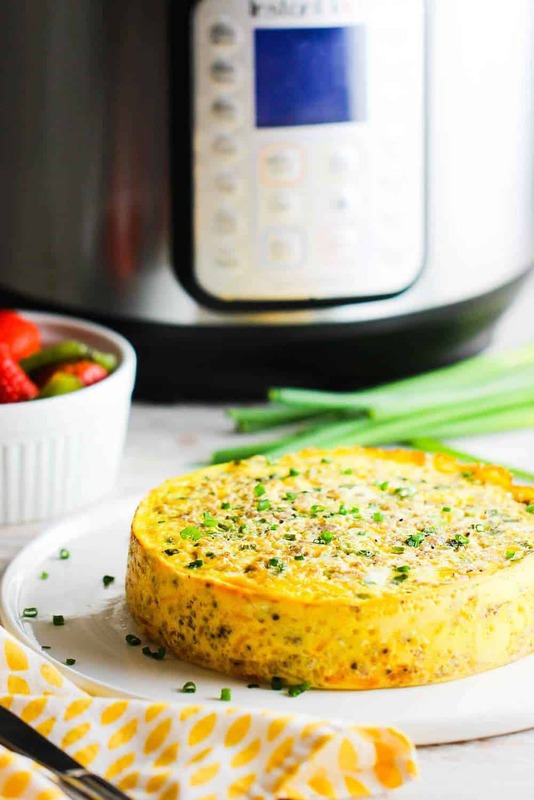 But, thanks to simplicity of a frittata, as well as the added ease of the Instant Pot, this recipe comes together very quickly and produces the most luxurious egg and cheese texture. Amazing! A frittata is basically a crustless-quiche, which makes it super easy to make. This recipe uses some of our favorite breakfast or brunch ingredients and comes together for the perfect morning (or any time of the day!) dish. You can add or subtract any of the add-in ingredients to meet your own likes! But, how can you go wrong with eggs, cheese, sausage and ham! 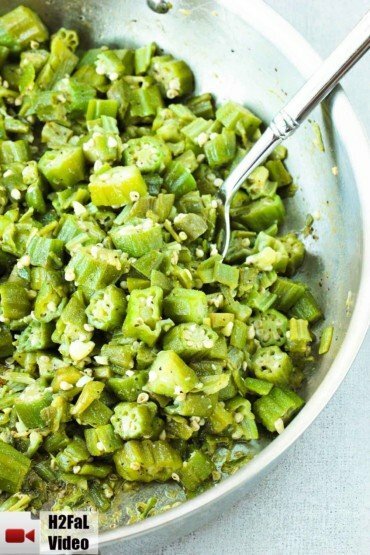 And maybe a little green onion for a little more boost of flavor! I like to make a ‘sling’ from aluminum foil to help me lower and remove the dish from the Instant Pot. All you have to do is measure out a piece of sturdy foil about 24″ long, then fold it over, length-wise, halfway. Then fold the other half over. And now you have a nice sturdy ‘sling’ to help you remove the dish from the Instant Pot, which is good, because the dish is usually piping hot! A 1.5 quart soufflé dish works perfectly for this recipe. If you don’t have one already, you can easily order one here and have it delivered super fast! If you’re in the mood for something really delicious for breakfast or brunch, but don’t want to spend a ton of time in the kitchen. 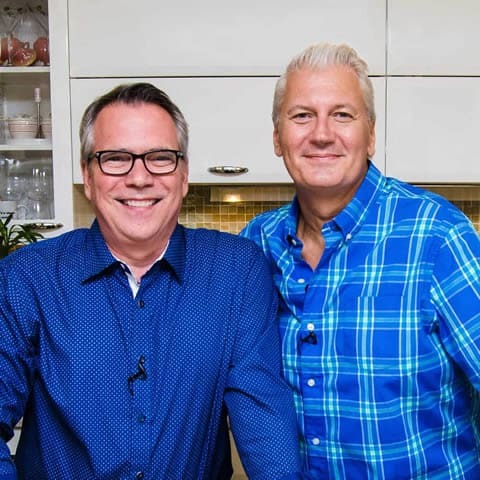 This recipe is the one you’re looking for. It’s so satisfying and just so delicious and literally comes together in about 40 minutes, or less. 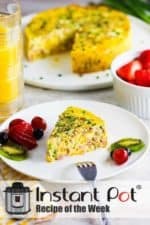 This is Instant Pot Breakfast Perfect! We love breakfast sausage and the addition of cooked ham is just perfect. You can of course cook up several strips of bacon and add at that in, too. Throw in some cooked broccoli or spinach, if you desire. The sky is the limit here! Go for it! 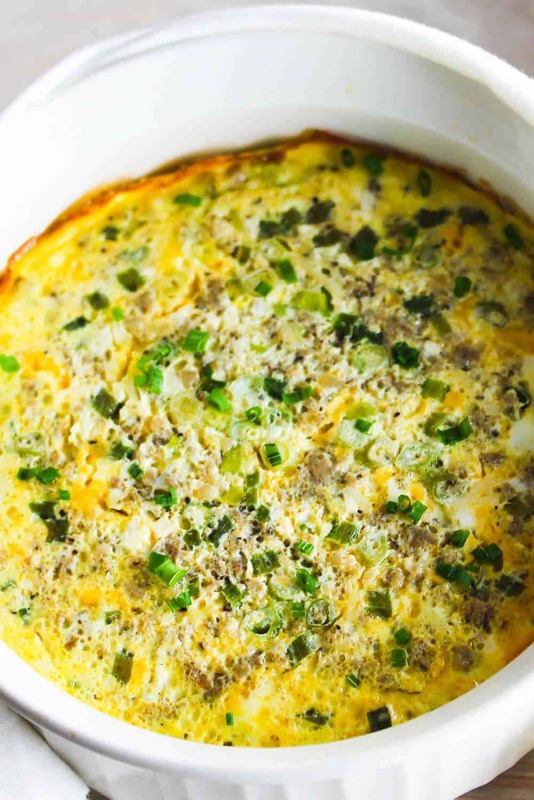 This Cheesy Sausage and Ham Frittata recipe is truly one of the Loon’s favorites. And I must admit, it’s one of my favorites, too. It’s classic breakfast/brunch fare. Add some fresh fruit on the side and a nice cold glass of orange juice, and you will be so happy. All in about 40 minutes!! 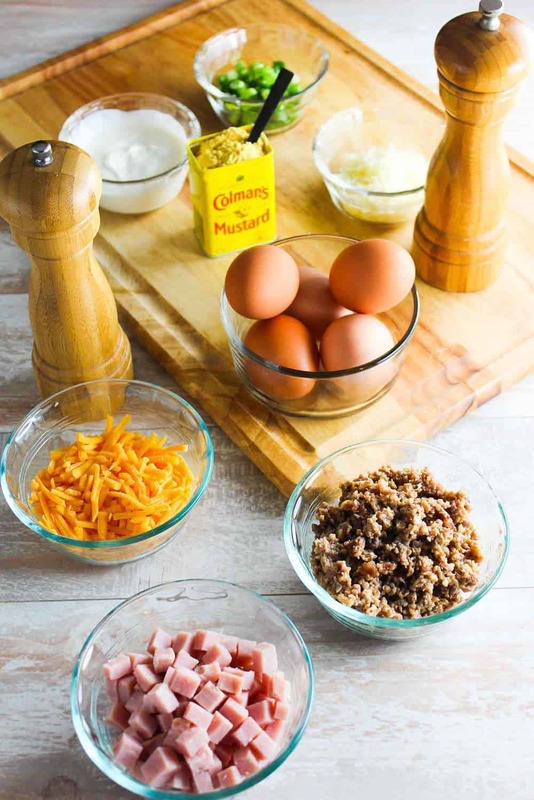 Now, go ahead and make this amazing Instant Pot Cheesy Sausage and Ham Frittata recipe! 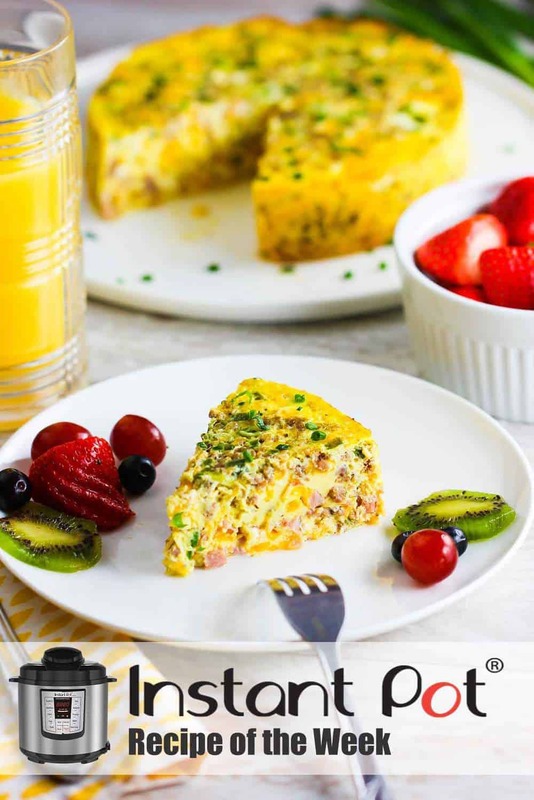 This Instant Pot Cheesy Sausage and Ham Frittata is so incredibly delicious, and thanks to the Instant Pot, so easy! It all comes together in about 40 to 45 minutes. Add or subtract of your favorite ingredients to your own tastes. But, we love this combo so much! Pout water into the Instant Pot and lower in the steamer rack. Spray a 1.5 qt. soufflé dish with cooking spray. In a medium bowl, whisk the eggs, sour cream and milk together. Add sausage, ham, cheeses, green onions, mustard, salt and pepper and stir until well mixed. Pour the dish into the prepared soufflé dish and cover tightly with foil. Make a foil sling with a 24-inch long piece of aluminum foil by folding one side over, length-wise, and then folding the other side over. Place the dish on the sling and lower into the Instant Pot, folding the ends of the sling over the top of the dish (See image in post for reference). Secure the lid and press MANUAL or PRESSURE COOK on HIGH for 25 minutes. Let naturally release for 5 minutes then QUICK RELEASE the remaining steam. 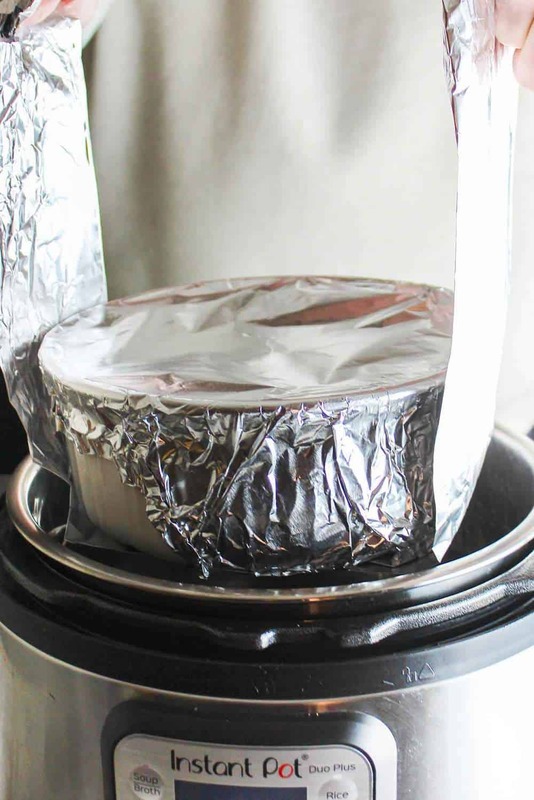 Carefully use the sling to remove the dish from the Instant Pot and then carefully remove the foil.